When Ellie Winters' parents are murdered, Ellie goes to the hiding place they had told her about--and discovers that she may have come to Earth from another dimension. To find her parents' killers, she will need to travel to a strange world and survive. She emerges in the middle of a civil war. The only way she can have her revenge is to help the heir to the throne become king--but when she does, she learns more about herself and about how ugly revenge can really be. Over the course of the story, Ellie's goals change as she adopts the people as her own and tries to bring them a better life. She has played a major role in securing the throne of one king, but is he really the person who can bring something like democracy to his world? With only her wit, the limited magical powers she discovers she possesses, the martial arts skills her father drilled into her, and the tactical advice of a mall guard she accidentally dragged along when she passed through the dimensions, Ellie needs to discover what is right--and decide how to play her role as KINGMAKER. Rich with an intriguing parallel universe, a magic system based on conservation of energy, and characters with complex motivations, KINGMAKER grabbed my attention and kept me reading. KINGMAKER is set in a post-gunpowder world with a political situation somewhat reminiscent of the reign of Richard II in England. Civil war and the ever-present threat of foreign invasion raise the stakes for Ellie and for the nation of Lubica. Fans of military fiction, fish-out-of-water stories, and good old-fashioned fantasy won't want to miss this story by best-selling author Rob Preece. See more BooksForABuck.com reviews of novels by Rob Preece. Supported formats: HTML, Adobe Acrobat PDF, Microsoft Reader, eReader (Palm Reader), Mobipocket (Kindle), Sony Reader, and ePub formats. Additional formats are available from Fictionwise. Check it out here. Want to buy more than one eNovel from www.BooksForABuck.com? Click the 'Add to Cart' button"
Not sure? Read the first chapter for FREE. 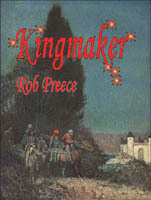 Buy additional formats of KINGMAKER from Fictionwise.com . Enjoy SF and Fantasy. Check out BooksForABuck.com's growing selection of affordable eBooks. Novel-length SF/Fantasy books at an unbeatable price. Here's the ShadowDark review of KINGMAKER. Here's the Speculative Romance Online review.